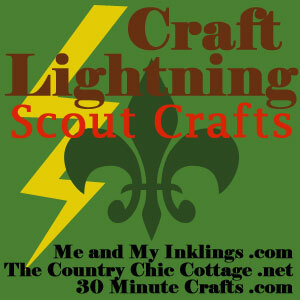 It's Craft Lightning time again and this one is all about Scout Crafts! I remember as a young girl attending Brownies and Girl Scouts was always a fun adventure and my favorite part was all the crafts we did! These organizations always taught such good values and important skills as well. 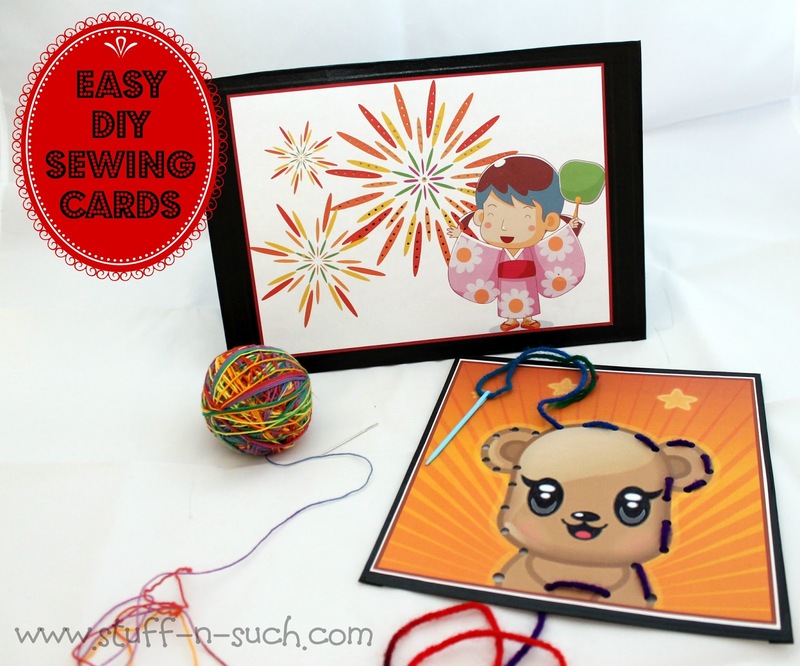 Sewing was one of the skills I learned back then and this project is a very basic way to teach beginning sewing skills! I first did this project with my Grandaughters a few years back, to help teach them to sew and now I am proud to say my 8 year old Granddaughter has graduated to using a sewing machine! As you know, I love to upcycle/recycle things in my crafts and these sewing cards were no exception. I used old cereal boxes for the cardboard and printed out cute and colorful pictures/graphics from the internet to paste on the cardboard. I found that the pictures looked better if I used a drier type glue to adhere them to the cardboard, such as "Zip Dry" glue which is used a lot in Scrapbooking projects to preserve the integrity of the photos and not make them appear "lumpy". I made two versions of the cards, one with small holes for older kids and one with larger (and less) holes for the little ones. I used some washi tape to cover the edges and poked the holes using a metal scribe on the small holes and the Crop-a-Dile II from We R Memory Keepers for the card with larger holes. 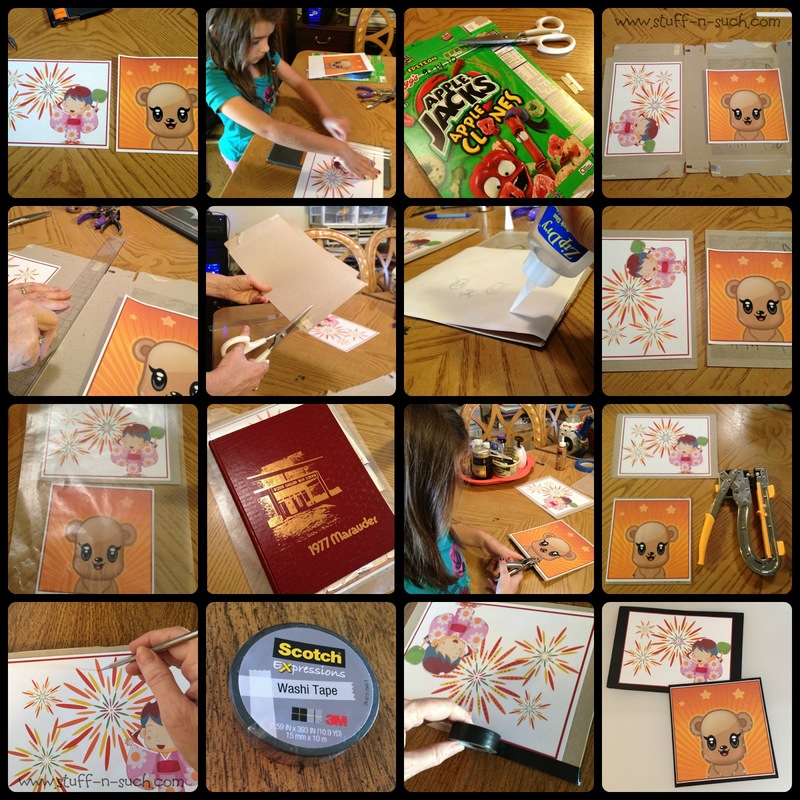 My Granddaughter who was 6 at the time was able to help with almost all of the steps in this project, so I would say it is perfect for any Scout troop with children ages 6 and above! She was mighty proud when she was done...and so was little sister! Be sure to stop by the other blogs featuring these fabulous Scout Crafts that only take 15 minutes or less! Just click on the Info Graphic Below. Thanks for visiting my blog, hope you will find this project useful and fun!